Mastery: Divine Bulwark now increases Shield of the Righteous’ damage reduction by 0.5% per point, down from 0.75% per point. Grand Crusader now also has a 30% chance to trigger its effect from Crusader Strike and Hammer of the Righteous. Shield of the Righteous now reduces physical damage taken by 25% (up from 20%). As I tweeted at the time, these certainly appear to be targeted at “fixing” haste. The logic for why they appear to do that is pretty straightforward. If you recall, Grand Crusader originally procced from successful Crusader Strike and Hammer of the Righteous hits. It was later changed to include avoidance (and later to proc only from avoidance) specifically to reduce haste’s value. So this seems like an obvious way to add value back into haste. Likewise, one of the things we noticed in MoP was that haste got stronger as SotR mitigation increased. When SotR mitigates a large percentage of damage, it ends up being more important to increase the uptime than to further increase the mitigation, favoring haste. In fact, one of the targeted nerfs to haste in MoP patch 5.3.0 was to reduce SotR’s base mitigation from 30% to 25%, which was further nerfed to 20% during WoD beta. So this change makes sense as well – increase SotR’s base mitigation to make it more valuable by default, and reduce mastery’s value by reducing its contribution to SotR. Seems straightforward. So of course, I expected that when I coded the changes into Simulationcraft (version 603-12) I’d be greeted with stat weights that told me haste was suddenly back in the limelight. Unfortunately, that isn’t what happened. Scaling plot before the 11/26 hotfixes. If you look at the html file, you’ll see that I’m using a fairly default configuration here. Sanctified Wrath, Light’s Hammer, and Holy Shield are chosen as talents, and the gear setup being used is heavily mastery-biased. That heavy mastery bias should help boost haste a little bit. As we can see on the plot though, haste and multistrike are both pretty weak, and performing below versatility, crit, and mastery, with bonus armor being far-and-away the best stat. Also note that since I’m running plots here, I’m only running for ~12k iterations, so the data is a little noisier than a full 25k iteration sim. Scale factors after the 11/26 hotfixes. Scaling plot after the 11/26 hotfixes. The first thing you’ll probably notice is that haste is solidly at the back of the pack now. In other words, these changes reduced haste’s value more than they increased it. So much for conventional wisdom! On the other hand, they did successfully weaken mastery – it dropped in value a bit, as evidenced by the lower scale factor and the shallower slope on the scaling plot. It’s still ahead of the other secondaries, but not by as much. First, I obviously went back and double-checked that I had implemented everything properly. But I was disappointed to find that I hadn’t made any mistakes – Grand Crusader was now proccing from Crusader Strike and Hammer of the Righteous, and the mitigation value being calculated for Shield of the Righteous matched what it ought to be based on a hand-calculation. So we can eliminate “programmer error” as the cause of these seemingly-erroneous results. So what did cause it? Looking at our assumptions with the benefit of hindsight (and data), it’s clear we overlooked some things. For example, let’s consider the SotR changes. Lowering the mastery contribution certainly weakens mastery, there’s no question about that. At low levels, when you don’t have much mastery, the buff to the base mitigation value of SotR should be more than you lose from the mastery contribution, resulting in a stronger SotR and (in theory) a stronger value for haste. But at higher gear levels, it’s actually a net loss in SotR mitigation, which could cause haste to get even weaker. To illustrate that, our T17H profile here has about 28% mastery. That contributed 21% mitigation to SotR pre-hotfix for a total of 20% + 21% = 41%. But post-hotfix it only gives 14% mitigation, for a total of 25% + 14% = 39%. As you can see, this makes SotR a little weaker, which subsequently makes haste a little weaker. Scale factors with SotR base mitigation buffed to 30% (+0.5% per point of mastery). Nope. Not enough yet. Maybe…. 50%? Scale factors with SotR base mitigation buffed to 50% (+0.5% per point of mastery). Well, that helps… but it’s clearly not enough. 70%? Scale factors with SotR base mitigation buffed to 70% (+0.5% per point of mastery). Success! Well, sort of. Haste isn’t the dump stat anymore, but it’s only tied with crit and versatility and multistrike. To push it up a little further we’d need to do something else, or nerf the other stats somehow. Also note that we’re easily hitting the 80% cap on SotR mitigation here, so mastery’s not giving us any extra mitigation through that vector, meaning that this is its value just due to block and attack power. What this tells us is that SotR mitigation is a really inefficient way to buff haste’s value. It’s taking extreme amounts of change to get any significant bump in haste’s value. We might be able to get to a good spot if we allowed SotR to mitigate 70%+ baseline and removed the mastery component entirely. You could imagine buffing mastery a bit to compensate by increasing its contribution to block chance. But we’re talking about a pretty extreme changes to how SotR works, which is not something to be done lightly. Scale factors with SotR base mitigation buffed to 25% (+1% per point of mastery). Mastery gets inflated a lot in this, of course, but haste still doesn’t really recover. That tells us something else: it’s not just the SotR change keeping haste down. The Grand Crusader change is actually having a negative impact as well. To figure out why, we just need to consider what adding Grand Crusader procs to Crusader Strike and Hammer of the Righteous accomplishes. No matter what gear you’re wearing, this means more holy power income, and subsequently, more SotR uptime. We assumed that this would logically make haste stronger, as we’re now amplifying our HP income more. But while this change does make each point of haste give us more HP generation, it also increasing the natural uptime on SotR as well due to the extra Grand Crusader procs. In other words, we simultaneously made haste give us more HP generation per point and removed some of the reason we’d want that HP generation in the first place. As it turns out, the latter is the larger effect. Scale factors after the 11/26 hotfixes, using Divine Purpose. But it’s not enough to make it a viable competitor with crit or versatility, let alone mastery. Ironically enough, haste was better off before these hotfixes. Why Is Haste So Bad? At this point, it’s worth considering why haste is performing so poorly, especially given how well it performed in Mists. Based on these results, it’s clearly not just a simple issue with Shield of the Righteous or Grand Crusader. So where do we point the finger and place blame? The answer is that it’s complicated. It isn’t just one thing dragging haste down. It’s really a combination of several different effects. First, there were some changes to the damage model. Mists gave us relatively hard-hitting bosses that could easily kill you in 3-4 seconds if your healer looked away. That has slowed somewhat with Warlords, with bosses being a little more deliberate. Whereas taking two back-to-back melees was a serious danger in Mists, it’s a little less fatal in Warlords, in part because of large increases in baseline effective health. As a result, there’s less emphasis on maximizing the uptime of SotR via haste (and the now-defunct hit and expertise) than there was in Mists. Improved Block makes mastery more valuable, but has almost no effect on other stats. Similarly, Holy Shield buffs mastery, but nothing else (well, crit/ap/etc. for DPS obviously, but we’re just considering defensive value here). Mastery now grants attack power – this is a huge change that significantly buffed mastery. It already gave us some solid survivability through more blocks and more Shield of the Righteous mitigation, but now we also get the value of a chunk of attack power with every point of mastery. Sacred Shield can now crit and multistrike, and benefits from mastery indirectly through attack power. It had none of those synergies in Mists. In addition, with the absence of huge piles of attack power through Vengeance, the value it grants to haste has diminished. In short, in Mists it gave haste a lot of value and nothing to the other stats; in Warlords it now grants some moderate value to all of the stats. Likewise, Seal of Insight now benefits from crit, multistrike, and mastery, unlike in Mists. As with Sacred Shield, this mechanic changed from being a primarily haste-focused effect to something that gives a little value to everything. That’s a lot of buffing to other stats and a fair bit of nerfing to haste. But that’s not the worst part, in my opinion. No, in fact, I think the biggest reason haste is weak this expansion is entirely unrelated to class mechanics. It’s actually fairly simple: the rating conversion got nerfed, hard. Consider that in Mists, it took 425 haste rating to get 1% haste, while it took 600 mastery or crit rating to get 1% of either of those stats. Now, of course, we can’t directly equate 1% haste to 1% mastery and say they’re of equal value. But we can draw inferences from relative worth of 1% mastery and 1% mastery, even if we don’t know exactly what that ratio is. So let’s assume you have 600 points of stat to allocate. In Mists, this gives us either 1.00% mastery or 1.41% haste. Even if 1% mastery is stronger than 1% haste, we get more haste to work with from that 600 points. In fact, as long as 1% haste is at least 71% as effective as 1% mastery is, the haste “wins” from the point of view of itemization (and thus scale factors). So in short: because we get a lot more haste percentage than we do mastery percentage from equal amounts of rating, gearing for haste can outperform gearing for mastery, even if 1% mastery is more effective than 1% haste. Now fast-forward to patch 6.0.2. The rating conversions got squished along with everything else. Haste now took 20 points of rating to produce 1% haste, while mastery took 23 points to produce 1% mastery. If we repeat our thought experiment with 23 rating, we get to choose between 1.00% mastery and 1.15% haste. Even in the absence of mechanics changes, that’s a big nerf to how effective haste can be. Numerically, it dropped to 1.15/1.41 = 0.816, or 81.6% of its pre-squish effectiveness. The rating conversion alone just knocked almost 20% off of haste’s value. Fast-forward to level 100, and the conversion gets even worse. It takes 100 points of haste rating and 110 points of mastery rating to produce 1% of each, respectively. So if we start with 110 points of rating to allocate, we can have either 1.00% mastery or 1.10% haste. Again, the margin just got slimmer, and haste just got weaker. All told, it’s now giving us 1.10/1.41 = 0.780, or 78% of the amount it did in patch 5.4.8. That’s a pretty substantial nerf to the raw power that haste can produce, and it has nothing to do with mechanics. That alone puts haste nearly at the top of the heap. The only thing that still beats it is mastery, which we can attribute to the smorgasbord of buffs it got through mechanics changes. Even without further changes, this would be a better state for haste, and we could start looking into ways to reduce mastery’s overly-high value to put it at it’s rightful(?) place atop our priority list. But I think this nicely illustrates the point: fixing haste isn’t going to be easy. It’s being kept weak by a slew of changes, both mechanical and “numerical” (in the case of the rating conversion), that have just made all of the other stats better. I’d be remiss if I didn’t give my own suggestions about how to help fix haste. Though, I’ll give them with an obvious disclaimer: both of these hotfixes were changes that I’ve suggested before as ways to improve haste, and we now see how well that turned out! First, I think it’s clear that Shield of the Righteous isn’t the answer. Unless the devs are willing to fundamentally change how SotR works, it’s just not an effective way to boost haste relative to the other stats. A fundamental change, like giving it a very large amount of mitigation with no mastery effect, might work at the expense of mastery. Another even more radical change would be to make haste increase its mitigation directly just like mastery does. For example, maybe it mitigates 20% + 0.5% per point of mastery + 0.5% per 1% haste (or more simply, 20% + half of your mastery percent + half of your haste percent). Likewise, Grand Crusader might not be the right avenue. Maybe if the avoidance-proc portion was removed it would be less detrimental to haste (and would certainly reduce the value of crit and strength). But I’m not certain of that, and we’ve already seen I was horribly wrong about the CS proc portion of the ability. Despite being a big portion of haste’s value in Mists, Seal of Insight isn’t a great candidate either. Buffing it would simultaneously buff haste, crit, mastery, and multistrike. However, as with SotR, you could imagine some more radical changes that would shift value out of crit, mastery, and multistrike and into haste. For example, if Seal of Insight healed for a fixed percentage of health rather than being based on attack power and spell power. That would make crit, mastery, multistrike, and versatility irrelevant and thus reduce their scale factors. If the fixed percentage of health was higher than the equivalent amount is right now (after accounting for Resolve), that could be a net gain for haste. I think the smarter avenue at this point is to try and focus on things that affect only haste, or affect haste more directly than other stats. For example, we’ve already seen that a large part of haste’s value was lost to the rating conversion. A simpler fix would be to modify that rating conversion for prot paladins, either directly in the game data or (more likely) indirectly by increasing the rating boost granted by Sacred Duty. If Sacred Duty suddenly increased haste from gear by 30% rather than 5%, haste would be back in business. Another route is Sanctity of Battle, since that’s where the bulk of haste’s defensive value comes from. Right now it reduces cooldowns by your haste percentage. If it reduced cooldowns by 1.3% for every 1% haste, that would give haste a large boost, much like a rating conversion change would. You could imagine adding an entirely new effect. For example, something that procs off of melee hits could selectively add value to haste if done right. However, there are a few issues with this. First, it means designing (and re-balancing around) a new effect. The proc effect itself has to be very specific as well – it can’t benefit from mastery, crit, or multistrike, so it would have to be something like a fixed-percent heal or an armor (not bonus armor) buff. And at this point, we’ve basically come up with a slightly redesigned version of Seal of Insight, so the question becomes “is this significantly different enough to warrant making a separate effect?” Still, a random armor proc from melee hits can only help haste’s value, inelegant as it might be. If we’re going for new effects, though, I think we’re more likely to get something useful if we think about it from a different perspective. Earlier, we discussed the slew of changes that made mastery so much stronger this expansion. Arguably the biggest factor is that it now grants attack power. In other words, we took a stat that was (relatively) weak and added value to it by piggybacking another stat onto it. Riposte does exactly the same thing for crit, in fact. It takes crit, which is weak for survivability on its own, and bolts on a bunch of value due to avoidance. It isn’t hard to think up ways to do this for haste. The simplest example, perhaps, is to blatantly copy Riposte. Riposte gives you 1 parry rating for every point of crit rating (from gear, anyway, let’s ignore the current issue with buffs). The new “Divine Riposte” could give you 1 point of dodge rating for every point of haste rating. This should give haste extra value without tweaking much in the way of mechanics, and without significantly altering the value of other stats. There are any number of ways to do this, in varying degrees from “ok I’ll buy that” to “completely breaks immersion.” “Momentum – increases your armor (or bonus armor) by a percent equal to your haste” is on the more logical end. “Shake it Off – reduces the damage you take by half of your haste percentage” is a little less defensible (though obviously, quite effective!). If you want to go to the extreme end of the crazy train, you could tack haste’s effect on to Shining Protector (what sense does that even make?) or cause it to increase your stamina (because sprinting is exactly like long-distance running…). In any event, my point is that I think the solution to our haste “problem” lies not in a raw mechanics change, but in a subtle, “tack some extra value on to haste” change. Of course, we should also talk about the elephant in the room. Is the problem that haste is bad, or is the problem that our attunement says we should like haste? Maybe we’re looking at this in entirely the wrong way. Why not change our attunement to mastery and be done with it? It’s clearly the dominant stat with the current mechanics. We’re going to extreme lengths here to try and shift value around to make haste better to match our attunement, potentially causing a lot of collateral damage in the process. It might just be easier to switch our attunement, not to mention less disruptive. Plus, many of us remember the days of Cataclysm when we loved mastery to death, so it’s not like we don’t have a precedent for being a mastery spec. This is problematic even for the simple case of a DPS class. I say “simple” because DPS is a fairly robust metric – easy to calculate, easy to test, and fairly reliable. But even within DPS, we find that the effects of crit, haste, and mastery (and other stats) are multiplicative. In other words, let’s say haste, mastery, and crit are perfectly balanced when you have 0% of each, such that each gives exactly the same amount of DPS. If you stack 20% haste (and no mastery or crit), you will find that mastery and crit are now stronger than haste, and this will be reflected in scale factors. Likewise, if you stacked 20% crit, mastery and haste would be the strong stats. The details vary from class to class due to mechanics, but in the most basic model you would want an equal mix of haste, mastery, and crit (by percent, of course, not rating). This isn’t news to anybody who’s theorycrafted a DPS class. If you played Retribution in Mists at all, you may have heard the advice “stack haste to 40%, then crit/mastery” – this was the reason for that advice. Stack enough haste, and you make crit and mastery strong enough to overtake it. Which means that no matter what, at some point your attunement “advice” is going to be wrong. Especially if you start with very close stat weights, which was the stated intent this expansion. Now consider how much harder your job gets as a designer if you want to do this for tank classes. First of all, how do you even decide which stat is strong? We looked only at TMI here, but we could have considered DTPS or DPS. Which is correct? Or do we look at a mix? If so, what mix? Furthermore, TMI is a fairly arbitrary metric, all told. You could devise a different metric for measuring smoothness and get slightly different results. In fact, you see this if you change the window size on TMI; the default TMI with a 6-second window (aka TMI-6) may give you different results than a TMI-4 or TMI-8 measurement. Which is correct? There’s no good answer to that question, which is one reason I was skeptical of the attunement system for tanks. If they had designed the class such that haste is our best DTPS stat but horrible for TMI, and TMI turned out to be the more relevant metric for tanking in the first tier, then the majority of the community would be ignoring that attunement anyway. And then there’s the question of tank balance – will we keep up with other tanks if they’re getting 5% more of their favorite stat and we’re trying to get rid of as much of our attuned stat as possible? Of course, the other tanks could have exactly the same problem…. I think what we have here is a prime example of where the attunement system goes wrong. Instead of just developing cool mechanics and letting the stats fall where they may, it’s acting as a constraint. Instead of just making sure that play is fluid and mechanics are solid, we’re tweaking things in an attempt to satisfy this “haste>all” edict. It’s worth pausing to reflect on whether this is a smart idea or not before proceeding with further changes. This is one reason I wouldn’t mind a bit if the attunement system disappeared in the next context patch. I get the point – to guide newer or inexperienced players. But I think that it’s more likely to end up being a trap than a help. I’d rather see the system removed and a small bit of text added to the “Core Abilities” tab of the spellbook. Something like, “As a protection paladin, you benefit greatly from Strength, Stamina, and HasteMastery.” That way, it can be updated based on how the stats shake out rather than acting as a constraint on design. As usual, there are limitations. I’ve only simmed a small subset of the possibilities, particularly choice of talents (Holy Shield, Sanctified Wrath) and gear (mastery-heavy). It’s always possible (if unlikely) that in a different gear set or talent configuration, haste gained some ground. I’d love to be able to sim a larger swath of configurations, but there’s only so much CPU time available, and it’s the night before Thanksgiving, and I’d rather be playing the expansion than simming it at the moment. It’s also possible that I’ve missed something, which is why I try to provide as much of the data as I can. If you see an egregious error or something that looks fishy, please don’t hesitate to write a comment and ask about it. The goal of this blog was never “Theck tells you how it is and shouldn’t be questioned.” It has always been an independent place for me to host my work so that it can be subject to peer review and community discussion. This entry was posted in Simcraft, Simulation, Tanking, Theck's Pounding Headaches, Theorycrafting, Uncategorized and tagged Active Mitigation, avoidance, blocking, buffs, game design, Holy Shield, Min/Max, Scaling, simcraft, tank, tanking, theck, Theorycraft, theorycrafting, TMI, warcraft, WoW. Bookmark the permalink. Great post, very interesting read. I’m on board for the swap to Mastery recognition, they are starting to grasp at straws to make Haste work and unfortunately the game has just shifted away from that (for the moment). They had a massive window in BETA to play with Haste mechanics and only chose now to try and emergency buff it, days before raiding starts. Too little too late. I’m still not sure why the devs gave us secondary stat attunments. They’re confusing if they’re supposed to be pushing us towards a specific secondary (and that push, as you mention, turns out to be incorrect), and invisible to most players anyhow. The number of people in my guild who even knew the attunement existed were equal to the number of people who read dev Twitter accounts. It feels completely superfluous and should have been cut. Extra complexity for absolutely no gain, and as you mention, significant detriment to class design. Excellent post. I’m on board with just giving up on Haste and changing our attunement to Mastery – I know the designers wanted all 3 specs of a class to have different attunements, but that rules i clearly already blatantly violated with DKs, Monks, Druids, and Warriors. In fact, Blood DKs, Guardian Druids, and Prot Warriors [i]all already share an attunement with a DPS spec from their class[/i], so the argument that Ret Paladins have Mastery means that we can’t is automatically invalid. Instead of jumping through hoops to buff Haste, instead make us Mastery tanks tanks and be done with it. There’s really no reason they couldn’t switch Ret’s attunement to haste, if they cared to. The Ret stat weights are all so close (or were, last I checked) that they’ll end up wanting a balance of stats regardless of which one gets the 5% rating bump. I don’t think the idea is that they want all 3 specs of a class to have different attunements so much that they want maximum possible spread between all specs of a given armor type, and among tanks and healers. Currently plate is split 3 Mastery-2 Crit-2 Multistrike-2 Haste. Flipping Protadin to Mastery would throw this askew, although as Theck says below Retadin could become Haste instead. But Tanking specs are split 2 Mastery-1 Crit-1 Multistrike-1 Haste currently. That change would make it 3-1-1-0, causing the majority of the tanks to want Mastery/Bonus Armor itemization and Haste/Bonus Armor items to be shards the moment they drop. I presume Blizzard is attempting to avoid this. So we need to find another tank to drop Mastery. And someone has to want Haste. Which infringes on Brewmaster’s Crit attunement. Well, someone needs to swap over to haste, so let’s move BM to Haste attunement. Disclaimer : I have no idea whether or not a Brewmaster Haste-attunement is even feasible, but let’s assume for the sake of argument that it is. But now leather needs a Mastery, Multistrike, or other Haste spec to become Crit Attuned. And it can’t be Guardian Druid. Or Resto Druid (only Haste attuned healer). Or Mistweaver Monk (then you would have 3 Crit attuned healers – same problem as tanks). Well, that leaves 5 possibilities. Surely one of them is workable. So now you’re talking about adjusting at least 5 different specs to make the itemization work out, because in WoD itemization is allotted by role and secondary stat instead of primary stat. Perhaps this is a solvable problem, but there’s a whole lot that would have to change to make this work. I admit to no particular knowledge here, but it certainly seems to me that making the current attunements work would be much easier and less disruptive to the players than changing 5 specs. Thank you for the excellent write-up, Theck. I appreciate the level of detail you go into, really no stone left unturned here. I was so excited when I first read those patch notes and had such high hopes for haste, but after reading your thoughts I’m just depressed now. To be honest, I’m very disappointed with the current stat weights. After sitting at such high haste levels for over a year, I’ve grown quite fond of the fast rotation. I liked being the haste tank, I liked being practically GCD capped, and I liked the pressure of maintaining an optimal rotation so quickly. With minimal amounts of haste now and no reason to stack it, I’m afraid that my tank is going to feel sluggish like this for the entire expansion. I can see that many of us are on board with simply forsaking it and officially switching our attunement to Mastery, but I’ll play the devil’s advocate here and claim that – for me, anyway – haste is the fun stat. I’ve reached the point where I play with Empowered Seals just for the 15% buff to it because it makes tanking feel more exciting even though it’s sub-optimal. I know that doesn’t really have an impact on theorycrafting and “fun” doesn’t help progression, but I sincerely hope they can find a way to help it out and maintain our position as the haste tanks. I want to get my GCD back down to one second without feeling guilty for hurting my raid. You hit the nail on the head in your post: all of our other stats have these side-effects that make them perform multiple functions at once. Crit increases our parry chance, mastery and bonus armor increase our attack power, multistrike increases healing taken thanks to Shining Protector, and haste… well, it doesn’t do anything. It would certainly benefit from a secondary effect like the rest, one that really brings it back to life. Your suggestion of letting haste increase dodge rating is in this vein. One idea is to move the attack power bonus off of mastery and onto haste. After all, haste was originally heralded as a DPS stat, so we could just make it play that role again. I think mastery is already performing too many functions so this would help dethrone it. This way, haste would help boost Sacred Shield and Seal of Insight’s power, while mastery would boost our block chance and SotR strength. Another idea is to approach it from the damage smoothing philosophy – what if SotR’s duration were increased with our haste rating? It’d have to be balanced so we couldn’t reach 100% uptime at some magical threshold, but I wonder what impact that would have. Then again, since damage spikiness isn’t as prevalent in Warlords as you mentioned, it might end up not helping much at all. I’ll have to think more about this problem, but I’m not ready to give up on haste just yet. What’s the best place to bounce ideas around, the thread over at Maintankadin? Probably starting a new discussion thread on MT, yes. Regarding moving the AP gain from mastery to haste – remember that every stat needs to give both DPS and TMI nowadays. The AP gain from mastery is needed to make it a viable DPS stat. Haste already gives a reasonable amount of DPS all by itself, so it really can’t gain much more in that category. That’s why my suggestions tended to side towards tying it to avoidance, armor, or even stamina – none of those would increase the DPS contribution of haste. Seconding this – I really miss the fast-paced play-style from Mists. I’m constantly trying to use abilities before they are off cooldown because I’ve become accustomed to 40%+ haste. I think at this point the most expedient band-aid is to just increase the bonus percentage awarded by Sacred Duty, although long term the attunement system should probably be scrapped as Theck suggests, and a more elegant solution devised. Hmm, I hadn’t considered that mastery would be totally invalidated if we removed its DPS contribution, but now that you point it out, it’s pretty obvious that the AP switch wouldn’t work. I’ll send you a message on MT about starting a new thread up, don’t want to clog the comments section here. This confirms my simulations, hence why I tweeted you yesterday as I was very surprised as well and thought maybe there is something wrong with simc very interesting tho. have you done any sims with high end gear like Blackrock mythic gear? also I noticed that below 20% mastery (buffed) the change is actually very strong mastery buff! only at 20% it stagnates and after this it gets a bit worse then pre- hotfix. No, I haven’t had time to run any sims with higher or lower ilvls, though your results make sense to me. I suspect going to Highmaul Mythic won’t make a huge difference (at least, not as huge as going from heroic 5-mans to heroic raid gear). Honestly, I’ve thought the conversion rate was the big source of the problem for a while now and it’s nice to see you run numbers to prove it. It isn’t just a Protection Paladin problem though. From talking to my raiders, it seems rare that anybody wants Haste right now. I am pretty disappointed that the problem seems insurmountable (I doubt they’ll change the conversion rating) because I REALLY love the way having haste feels. Currently, I feel like I’m waiting around on globals and cooldowns all the time and it feels bad. Fully agree about attunements being gone. They’re a pain in the rear as Tanks and especially in cases where DPS specs actively choose to avoid the stat that they’re supposed to care about the most. I’d certainly be on board with trying to increase relative stat parity as a whole, but sometimes the problem is really just the big arrow pointing in the direction of a suboptimal choice. Urg….if they fix pallies attunement, i hope they hit warriors as well. Our atonement is just about notkeeping mastery on par with crit for DTPS, and for TMI i’m getting both Crit and Versatility ahead of mastery for warriors., maybe they jut need to massively buff tank attunements. Just throwing a potential idea out there, would putting an internal CD on blocking individual mobs and having that be reduced by haste help balance this out? As we stack more mastery we block more, causing an increased chance of hitting the internal CD. Obviously it could create some balancing issues with prot warriors but I think it could make for an interesting mechanic. This could also be tied into multistrike having a chance to not trigger the internal CD. The internal CD would have to be longer than the mob’s swing timer for that to have any effect (so e.g. maybe 2 seconds, such that you can only block every other attack). But all that would do is create a haste breakpoint at whatever amount it takes to reduce the ICD to a mob’s swing timer. It would make mastery weaker before you reach that haste breakpoint and stronger above. Of course, the longer you make the ICD, the more haste breakpoints you introduce. All in all, though, that’s not a very transparent system, so I doubt it’s a solution Blizzard would be interested in. I’m happy to test some of the ideas you presented here and any other ones that other people contribute in that thread. This expansion is the first time I’m playing a prot paladin and so I’m new to this blog. It is a big help and thanks for the amazing effort! I hope you can answer a few of my (maybe newbish) questions. 1: I read that there are no DR on any of the stats right now. So 110p mastery is 1% regardless how much you have. So why does every stat become worse the more you stack it? 2: I’m using Seraphim right now because i feel with the right rotation its better in terms of survivability than Holy Shield. So when the stats get worse does that mean that at some point, maybe around 655-670 ilvl Holy Shield is the obvious choice because the 1000 stat buff from Seraphim ist that good anymore? 3: At the moment i have about 25% mastery selfbuffed. With Seraphim I have ~9% more through the 1000 more points in mastery, but my block chance only raises about 6%. Maybe I oversaw something but why don’t I get the whole 9% increased block? DPS = base_dps * (1+haste%) * (1 + crit%). If your base_dps is 100 and you have 0% haste and crit, then adding 10% haste gives you 100*(1+0.1)*(1+0.0)=110. Adding 10% crit does the same thing: 100*(1+0.0)*(1+0.1)=110. However, let’s say you already have 30% haste. Your DPS is actually 100*(1+0.3)*(1+0.0)=130. Adding 10% haste increases that to 100*(1+0.4)*(1+0.0)=140. Adding 10% crit instead increases that to 100*(1+0.3)*(1+0.1)=143. As you can see, it’s not that haste got worse (10% haste still added 10% times your base_dps, or 10 dps). It’s that hitting more frequently causes crit to become stronger. This interaction works the same way with multistrike, versatility, strength/agility, and for some specs mastery (depends on the implementation). 2) Seraphim gets stronger the weaker your gear is, so yes, at low ilvls it’s probably stronger than Holy Shield if you can properly perform the cooldown rotation. That said, even at ilvl 680 Seraphim is a solid contender (see previous blog post). 3) Block has diminishing returns, just like dodge and parry do. Just a thought …. what if you just gave a flat 15% Haste buff? As Haste is multiplicative, this basicly makes the stat 15% better and gives you that faster pace feeling again. Depends on how it’s implemented. A flat additive 15% haste wouldn’t matter. If it was treated as multiplicative with gear haste (like the raid buff and bloodlust are), then it would help. But really, the easiest solution there would just be to buff Sacred Duty so that it gives ~20% more haste from gear rather than 5%. Actually, it wouldn’t help much at all, because it would also (partially) increase the value of other stats through Sacred Shield, Seals, HoPo generation and so on. Napkin math says that to make Haste become 15% better we’ld be looking at hitting GCD Haste cap in blue gear. Not very enticing. Once again theck a very nice informative article and spot on as always. Im still rather sad to see haste be our worst stat i absolutely loved the play style in MoP. I will be patiently waiting and hoping haste will come bk in the spotlight again. Until then back to mastery it is blocking spells with holy shield and all that good stuff. Slow and boring but tanky! 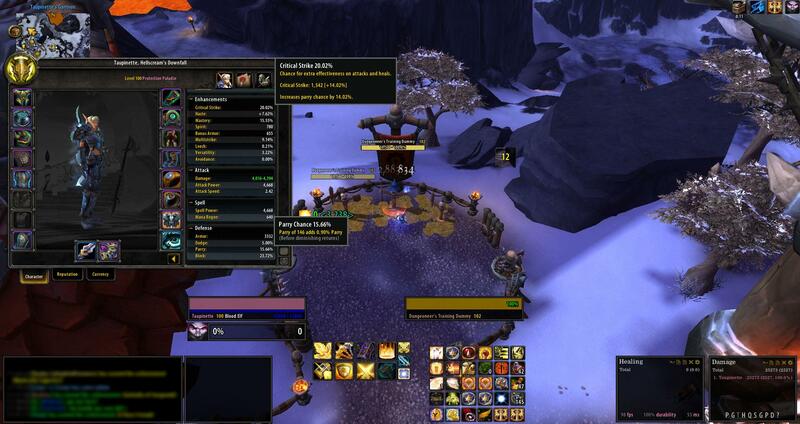 Another easy way to fix stat attunements and for a longer period of time could be to make it say you gain 5% more of your highest stat, but i guess that defeats the purpose blizzard has in mind for it. Any way an increase in uptime for SotR over the current 3 sec would help smooth things? Stealing me idea eh there A! I was actually thinking about that after you had logged off and realized it would also make mastery more beneficial with the added up time, it would likely help bring haste up with the other stats if SotR duration was increase, but it would also make mastery better as well. Or , thou awkward sounding maybe lower the cost of SotR . Or uptime based on hopo spent, thou would conflict with seraphim I would think. Increasing the duration of SotR (without changing anything else) should actually be a significant nerf to haste. No need for higher HPG if you can already get high uptime on SotR. If you want to think about improving haste via SotR duration, you’d need to go the other direction. The discussion we had was to have haste increase the duration. Oh. Yeah that could increase it. On the other hand, that’s essentially what it does now anyway through Sanctity of Battle – increases uptime. In practice, having haste increase SotR’s duration would be no different than increasing the rating conversion rate (or buffing Sacred Duty). That is true, but with haste increase SotR duration it would keep the same effectiveness past the 50% haste break point, it also means that the GCD of your abilities affected by Sanctity of Battle would be able to maintain the same GCD as your other abilities, personally I would think it would feel a bit clunky if there were 2 sets of abilities on with different GCD’s. Great post. But I’m curious, have anyone considered to toy with a healing-heavy build in this season? I mean self-healing, plus possible group/raid healing with eternal flames or selfless healer. Let’s imagine there is a fight where enduring heavy physical damage is less relevant. I.e. SotR is somewhat useful, but it’s much less likely to save your life, unlike extra healing. For whatever reason. Maybe this fight is mostly spell damage. Maybe you’re offtank most of the time and barely take any direct melee hits. Maybe something else. Is there still a theoretically possible build where this gameplay model would work? And would it, perhaps, still favor haste, even with current stat weights? I know it worked quite well in MoP, at least for me. It was pretty easy to outheal every healer by a mile in most of the raids and do more self+raid healing than you take damage without ever risking being 1-shotted. By just spending most of HP on EF to whoever takes damage (favoring yourself, of course). Yes, sure, tank healing was heavily nerfed in WoD, but it’s still not neglectable, as to what I can see right now. Or at least it doesn’t appear to be right now with low gear levels, especially in 5man hc/cm. So, if we have EF, Divine Purpose, Holy Prism (?) and probably Seraphim (or even Emp Seals?). And a task of offtanking some lightly-hitting adds or spell-hitting bosses, while supporting group/raid with occasional spot heals. Is that possible to sim somehow? I don’t know much about sims, though runned some back in Cata, but never took enough interest in it ever since. Also, this T17H sim, but is it no different for currently actual “getting ready to step into raids” gear level of 630-640? Self-healing was nerfed a lot harder than you realize, I think. Even with Resolve and 5 stacks of Bastion of Glory, Word of Glory doesn’t heal for that much; without 5 stacks of Bastion it’s pitiful. We really won’t be sticking to the WoG-spam play style for anything other than a magic-damage gimmick boss (Lei Shi for example). Stat weights aren’t much different in lower-ilvl gear. What changes a bit are talent preferences – Seraphim is a bit stronger when your gear is weaker than it is in T17H gear. From what I hear, most players working on gold challenge modes are using Seraphim right now. Hi, I know it has nothing to do with the post but, well..
As you can see, parry isn’t updating with the Knight’s Badge proc which increases critical strike by 1396. Do you know if it is intended or if it’s a Riposte bug / tooltip bug? I tried asking blizzard ppl on twitter but I didn’t get any response. It’s a known bug. Only crit from gear gets converted to parry. They actually had to modify Seraphim slightly during beta to make that work (and I suspect the solution there was just to add 1000 parry rating behind-the-scenes). There’s no ETA on it being fixed, and I’m not optimistic that we’ll get one. Note that I haven’t coded this restriction in SimC yet because I’m not entirely sure there’s an easy way to do it yet. what is you’re oppinion on the changes to Eternal Flame that increases the instant heal +25% does it mean that Eternal Flame is better now then Sacred Shield. or is the loss in dps from picking Eternal Flame over Sacred Shield to much? No. If you re-read the hotfixes, they also buffed Word of Glory. This isn’t a surprise, because the initial heal of Eternal Flame has always been identical to Word of Glory. That’s why the initial heal is 100% irrelevant to the value of the Eternal Flame talent. So no, that hotfix has no effect whatsoever on EF, it still pales in comparison to SS. So I just simmed myself…and Crit is kicking my TMI out of the water. What give Theck? Is the parry bonus that attractive, perhaps something to do with Grand Crusader? Or is this Seraphim talent the real culprit? Yes, if you look back at the previous blog post, Crit performs pretty well if you take Seraphim. Which is quite handy if you want to gear up a holy off-spec. Do we have any sense on whether Blizzard will try again to fix haste? Should I be holding on to Haste gear just in case? I have no doubt they’ll try, but probably not until 6.1 based on recent comments. Thanks for all the info I could find on your blog, it’s really helpful. I just have a small issue which may alter the less than expected results of Haste in this extension. My issue is to know whether or not the TMI should be modified when you consider that now spikes are less an issue. In WoD (with respect to MoP) you want to minimize the long term damage more than the spikes because of the boss mechanics and healing mechanics. On one hand, boss don’t hit for more than 50% of your hit points, on the other hand, the healers may have issues keeping enough mana to keep healing you if you take a lot of damages in the long term. So, did you adjust TMI according to the new profiles of boss battles ? No, because I disagree with your base assertion. Minimizing long-term damage taken (as in, DTPS) is still irrelevant to tanks. Tank deaths are still primarily due to spikes, they’re just a little longer now. If anything, TMI is *more* relevant in WoD than it was in MoP, simply because a 6-second spike window is more realistic now than it was in 5.x SoO, simply because the deaths there tended to be even shorter (3-4 second spikes, sometimes less). What’s the difference between armor and bonus armor? Why is bonus armor so much better than normal armor? How do I read the graphs? I understand that a longer bar means it is more valuable to your survival but what do the numbers next to the bar mean? Every point of bonus armor also gives 1 AP. Normal armor doesn’t do that. The numbers next to the bars are the amount of TMI each point of that stat takes off. Does that mean that bonus armor is almost 9 times better than stamina from the perspective of TMI? No. The bars are linear and proportional. The numbers for Bonus Armor are getting cut off because the text is too long. Sacred Duty now causes the Paladin to gain 30% (up from 5%) more of the Haste stat from all sources. I wonder how will it affect the trouble with haste? Somehow, I doubt it just made haste 25% (or more precisely, 23,81%) better… And even if it did, would it be enough to get haste above the other non-mastery stats? Unless I do have it totally wrong (which I might, considering that last time I did any considerable math was in 2004), this would bump percentage of haste that we get per 100 haste by the aforementioned 23,81%, that means from 78% of pre-WoD effectivnes to roughly 96,5% (considering I did some rounding, and that other might be involved that I do not know about, the actual value might differ somewhat). The Haste stat is now 11.1% more effective. For example, characters at level 100 now receive a 1% increase per 90 Haste (up from 1% per 100 Haste). And it also probably completely threw my numbers totally out of whack, so, nevermind, nothing to see here! Just an FYI that it totals a 37.5661% increase in value for the Haste stat. Depending on talents this pushes it to anywhere from “atleast viable” to competing with Mastery. So with today’s changes to haste rating in general for every class and it being 30 percent instead of 5 percent increase for prot paladins are we “back in business” as you said in this post?